It’s happened, guys. I’ve finally learned how to stand up for myself, to set a boundary and do it in a kind way. I’ve finally learned to state my difference in opinion without getting mean. Saturday, my Daisy troop attended camp. During our camping adventures, there was a pretty big disagreement with my co-leader. It was over his unilateral decision that the girls— who will be brownies next year— wouldn’t participate in the bridging ceremony at camp because his own daughter is not continuing on. He ended up getting quite mean, and said some cruel things. I eventually snapped, but I held it together for a long time. Things ended up okay, because a mom from our troop overheard the whole exchange, and felt that my point was valid, and that I was in the right. The troop moms discussed the thing, sided with me, and the girls were able to participate in the ceremony. I wrote him a letter, not to send, but to get my feelings out. I’ll share that here. You were completely out of line, and extremely rude. What you said was cruel, and untrue. I can not say the same for you. We didn’t have snacks at meetings because it would spoil Katie’s dinner. A parent was told not to bring pizza as a reward for hard work to wrap up cookie season bacause Katie doesn’t like pizza. We stopped doing magic scrap during clean up because Katie got upset and cried everytime she wasn’t the one to find the scap. You didn’t want to do SWAPS at each meeting because crafts with fine motor skills frustrate Katie. You didn’t want to do crafts in general because Katie needs more time to complete things than we can allocate during meetings. We didn’t sing songs because Katie doesn’t like to sing. We weren’t allowed to play freeze dance as an opening activity because Katie gets too wound up when we do. We couldn’t play games because Katie can’t handle losing. I understand wanting to make things comfortable for our kids. I understand wanting them to be happy. As a parent, of course I understand that. It’s what we all want for our kids. The thing is though, when you sign on to lead a Girl Scout Troop— or really any small group of kids, be it scouting, or a school activity, or soccer, or a small group at church— it’s no longer just about YOUR kid. It can’t be. When you put yourself in a position of leadership, of power, over a group of children, the focus has to become what is best for the group as a whole. It can no longer be about what is best for your child. I can think of one time where I said we couldn’t do something because my daughter didn’t want to, and even then the “we” was myself and my daughter— not the entire troop. Your main concern the last two years was not upsetting Katie. You have had a double standard the entire time you have been troop leader; if Katie wanted to do something, but another girl didn’t your stance on the matter was “too bad, this is what we are doing”, but as soon as Katie didn’t want to do something, then we just weren’t doing it. You made a huge deal and gave a special presentation for Katie bringing back a special swap for our troop flag when you took her to a special event, yet when a mom asked you to get a special award for her daughter who called 911 when mom was severely injured, you simply handed the girl the patch after the meeting was over. How is this fair? How is this not you giving your daughter special treatment over the other girls? Your favoritism towards your daughter has been unfair to the entire troop. I also happen to believe that it is a disservice to her; one day she will learn the sun doesn’t rise and set on her shoulders, and that is going to be a painful, heart breaking day for her. The decision that our troop wouldn’t bridge at the camp ceremony— along with all the other girls in our area— based upon the fact that one girl wasn’t bridging up to Brownies was unfair to the rest of the troop. I’m sorry you felt that I didn’t care if Katie would be upset. I’m sorry that you felt I wanted her to be singled out. This wasn’t a case of me not caring about Katie’s feelings. I care about Katie as much as I care about every other girl in our troop. I saw the situation differently than you, and felt that it was unfair to expect the rest of the girls in our troop not to bridge because of one girl. Had the situation been reversed, I never would have expected this. I would have explained to my daughter that she wasn’t bridging because we had chosen not to continue with girl scouts, and we could watch her friends bridge and be happy for them or that we could join in because she had completed two years of Daisies, and deserved to celebrate that. There didn’t need to be any hurt feelings, there were many options and ways to handle this situation. My concern was for the troop as a whole. The girls deserved to participate in that ceremony. Clearly, you were triggered when I pushed back on this issue. The thing is, I pushed back calmly and from a place of curiosity. My question was “What about the 7 girls who are bridging? How is it fair to make them sit out the ceremony and watch every other bridging troop participate because of one girl who is not bridging?” I should have walked away when your response was a snarky, “I see. I see, it is just fine for my kid to be the one left out as long as no one else’s kid feels upset!” Unfortunately, I didn’t walk away, and tried again to have an adult conversation. “That isn’t what I am saying. I’m posing the question of if it is fair to have the rest of the troop miss out on something because one of the girls is not continuing on?” We went back and forth, me attempting to question why it was okay to keep an experience from the entire troop because of one girl and asking how you thought the girls would feel watching everyone else get to bridge, and you continuing to say that you didnt want Katie to feel singled out, or left out, or have her feelings hurt that she didn’t get to bridge, and then you finally going off on me about my spoiled daughter and how she and I have ruined your and Katie’s experince of Daisies. I regret my sarcastic, “Fine. Fine. Just do whatever will make Katie happy.” However, the way you behaved was way out of line. Firstly, because if that were something you felt to be true, you should have had a mature discussion about it with me way before now. Secondly, as I stated earlier, as a leader, we have to do what is best for the majority, not what is best for my kid or yours. 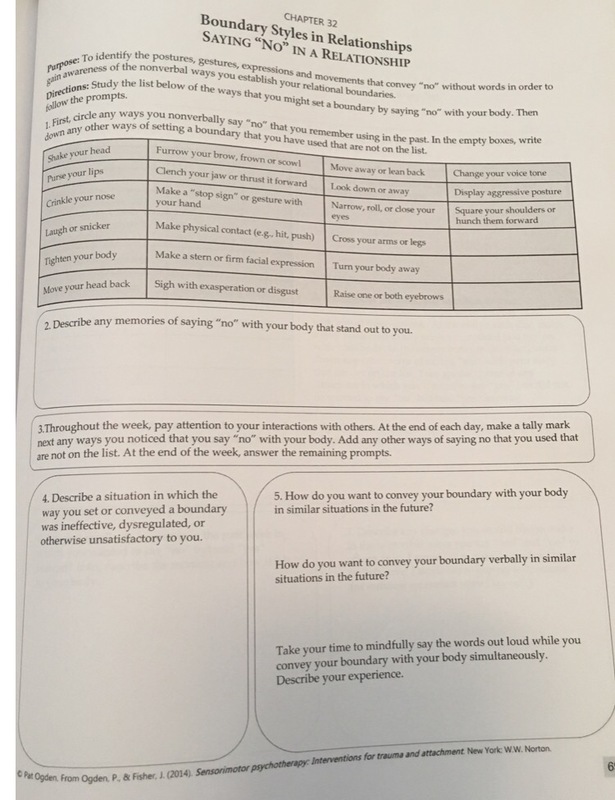 Are there times where accomadaions had to be made for my daughter? Absolutely, because she is autistic. Not one of those accommodations were made at the expense of the troop, though. My daughter knows she doesn’t get special consideration because she is the leader’s child, or because she is autistic. I did my very best to express my differnce in opinion from a place of kindness, of understanding where you were coming from, and with curiosity. I’m sorry if that didn’t come across to you in my words, but I truly was not trying to upset you, or hurt your feelings. I wanted to have a conversation, to share our different views and to come to a descion together. I’m sorry it did not work out the way I had intended. Boundaries. 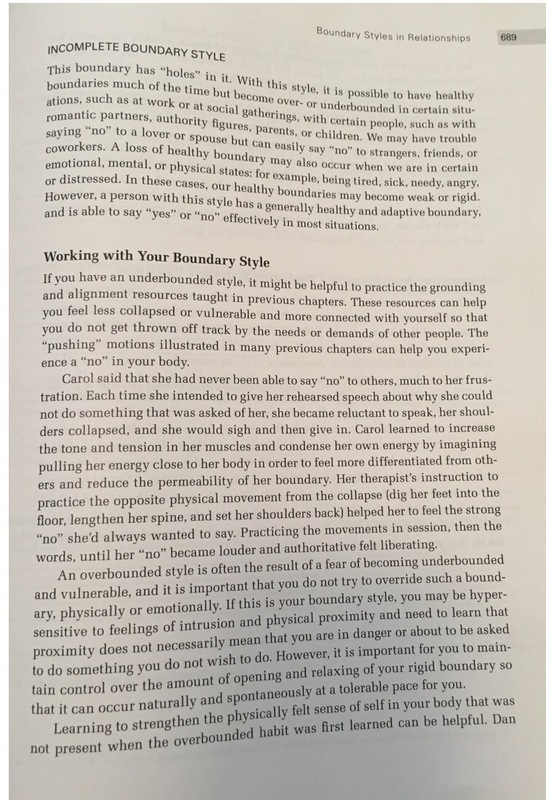 Boundaries have been very much at the forefront of therapy the last few weeks. Boundaries are hard, they feel frightening to me. 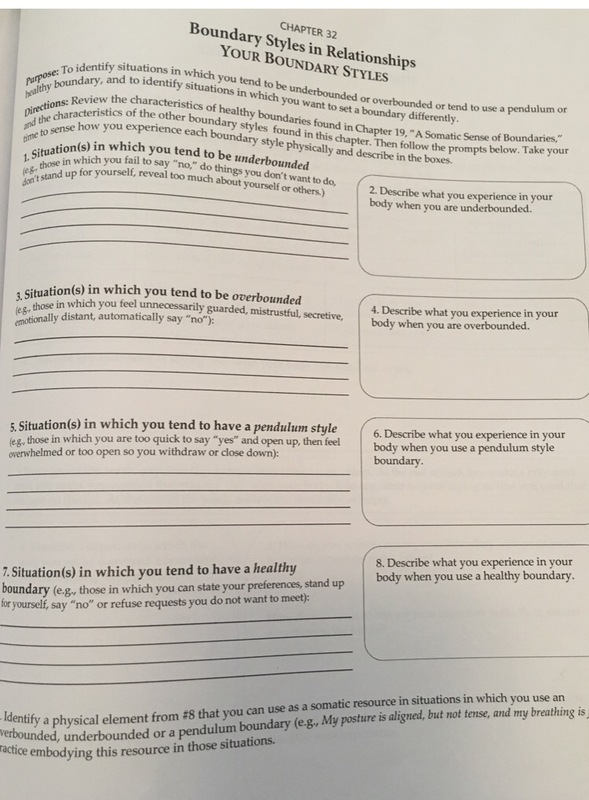 Bea says that dissociation is a boundary, and it’s the only boundary the little girl had, so I learned to use it very well. I learned to use dissociation to keep uncomfortable, scary things out, but I also learned to use it to keep things— like emotions, or thoughts– inside. It’s automatic for me now, to go away. And dissociation is the only boundary I truly feel safe setting. The little girl is so present today, she is driving the ship, and she is frozen and scared. Nightmares of Kenny and my mother not being there are very present and very real right now. Bea tells me that she could really sense the vulnerability and need to be cared for and how easily the little girl could be confused about who is safe. She says she can feel and see how when the little girl is in this submissive state it would be so easy for her to be hurt by a bad guy. Bea says that this is a reason we need to work on boundaries, that being dissociated was a good boundary for the little girl but the grown up can have other boundaries, boundaries that can empower her and not put her into a submissive place. The grown up me gets what she is saying, and is fully behind it, but Little Alice? She doesn’t understand, and is suddenly very frightened that Bea wants to hurt her. I end up in a weird here but not here at all place, and Bea and I end up emailing a few times before the next session. I’m scared walking into Bea’s office. I’m aware enough now of my parts to know its Little Alice who is scared, and the teen who is feeling so wary and mistrustful. I sit down and curl up on the couch immediately. Quickly I dig through my bag and almost throw my notebook to Bea. “Here,” I whisper to her in a feather soft voice. I shrug, and Bea sets the blanket next to me. She starts reading, and when she pauses to reply to something I’d written, I throw the blanket over my head, terrified and embarrassed. I had written out this fear that Bea wants for hurt me in some way, explaining how to the adult this notion is silly and embarrassing, but to the little girl there are so many parallels to be drawn. Kenny listened to the little girl. Kenny wanted her around. Kenny liked her. Kenny wanted to spend time with her. Kenny didn’t need her to be perfect. Every one of those things could also be said about Bea. I wrote about how I– the adult– knew Bea wouldn’t hurt me, but Little Alice heard Bea say it, and was scared. I shrug. It takes a long while for me to answer. I know Bea wouldn’t ask if she weren’t sure it would be helpful, and I know she is finally able to understand what shrinky is and why it scares me, so I finally whisper, “Okay.” Even after agreeing, I still feel very apprehensive. “Maybe…..a little.” I whisper. Little Alice does not like this idea of a giant thought bubble separating her from Bea, and the teen is not sure about this idea, that it is true, but she’s willing to at least think on it. “I know this is hard. I know it’s really scary for the little girl. That’s why it’s important to have the adult online with the little girl. You both need to be present. Little Already will feel so much safer with the adult present, too,” Bea says to me. Instantly, I am farther away. Little Alice wants Bea, she doesn’t want the grown up. She knew Bea didn’t really want her. I shrug. I don’t know. Everything feels mixed up, and the adult me is embarrassed over my reactions, and the little girl is scared and sad and ashamed. “It’s a trick.” I finally whisper. The little girl is unsure she believes Bea. She just can’t trust that this isn’t a huge trick. It hurts to not trust Bea. Bea is reading my journal again, because I have no words. Leaving. What is the deal with my fear of being left? Bea asked me about that last week, why the little girl is so sure that Bea will leave, that hubby will leave. I’m not entirely sure. I’ve never really been physically left, except when my mother went to the hospital when I was nine. The fear of being left seems to stem more from emotionally being left. It’s more this unspoken rule of *if you aren’t ABC and don’t do XYZ, then you don’t belong, you won’t be accepted, and we will leave. We won’t be able to love you or want you.” It’s every therapist leaving (or perhaps more accurately, allowing me to leave and not fighting for me), it’s my first grade teacher not following up on the picture of monsters I’d drawn and told her that the monster comes in the nighttime and plays games and hurts you. It’s my aunt who divorced my uncle and left the family, but she didn’t stay in touch with me, even though she was more like mom to me than my own mom at times. It’s my Dad being checked out (because his personality is to not deal with emotions and to be sort of zoned out in his own head) and my mom emotionally leaving me time and time again. It’s this sense that if I need too much, if I’m not perfect, if I don’t be exactly what others need me to be, then they will leave me, they won’t love me, or want me. This obsessive fear of people leaving me could be because I have been more real, admitted mistakes, shown my imperfections, had feelings and displayed them, showed my vulnerabilities and admitted to having needs. These things are dangerous in my world, it’s breaking all the rules and it is very scary. “Okay….” I say the word slowly, like molasses pouring from my mouth and mixing with the air around me. I shrug. I know I should say something, so I whisper, “Okay,” even though I’m unsure it really is okay. It sounds like she is apologizing and saying she is wrong for rushing the little girl to let the adult on board, but the ultimate goal is for the grown up to always be *online*. Once again, adult me understands and fully supports this. The little girl, however, is hurt. In her mind, Bea just wants to get rid of her. I’m far away. Between a nightmare I can’t speak and Bea talking about boundaries and SP, I can’t be here. It’s too much. *No. No game* I think to myself, and I go far away, almost instantly. I want to tell her that it’s not like that, not exactly. I want to say that it’s more about what is being talked about, and why she is wanting me to come back. I want to say if I need to come back to get ready to leave or if she is talking about normal everyday things, then it feels safe to come back. The content of the conversation in the room is safe. But if she is asking me to come back, because she feels I need to be more present in order to process what we are talking about, then it’s a no go. Bea talks and I listen, and we sit in silence. “I don’t like silence. It is scary,” I say. “I know. It’s why I usually talk to fill these silences, and it would be very easy for me to do that. But I wonder if I’ve dome you a disservice by doing so. Maybe I am blocking things that might otherwise come up by talking.” Bea’s voice is very serious. I shake my head. This is uncomfortable. I hate this. Tears well up, and I angrily brush them away. I don’t like what she is saying. Some part of me, not the grown up part, maybe the teen part is really hurt by this. How can Bea feel like this? If she hadn’t talked and filled the terrifying silences, I would have left therapy. I never would have been able to write to her like I did. I would never have begun sharing anything with her. I wouldn’t be healing, I wouldn’t be where I am. So how can she say that filling the silence was a disservice? It’s like she is once again comparing how we did things in therapy before SP with after SP and only the SP way is the “right way to process trauma”. Why does it matter how it is processed? Isn’t the point to feel safe enough in the therapy relationship to be able to share the ugly stuff, all the feelings, the things that are scary to say out loud, with your therapist? Well, I felt safe enough because of how we did things. It’s like she is saying none of that stuff counts because it wasn’t the *right* way, and that she has to change everything so that we are doing things *right*. I hate it. I hate this, and I want desperately to say all of this to her, to have a conversation about it, but I can’t find any words. She says something about how in order to work through my nightmares we have to give my adult more resources, I have to be able to stay more present, to control this going away a bit better and that this child needs to be able to allow the adult online to help. It’s not all said at once, but for some reason, my brain lumps these words together. Little Alice wants to stomp,her feet and scream. It’s not fair! Bea won’t help with Nightmares until I do all these things. It’s like being told I’m not good enough to be helped, or being punished for needing to go far away in order to set a boundary. But it’s not fair. Why do I have to do all these things I hate, that are uncomfortable, just to work through another scary thing? It’s not fair. By the end of session, I’ve said nothing and I leave feeling disconnected, sad, frustrated and a little angry at Bea. 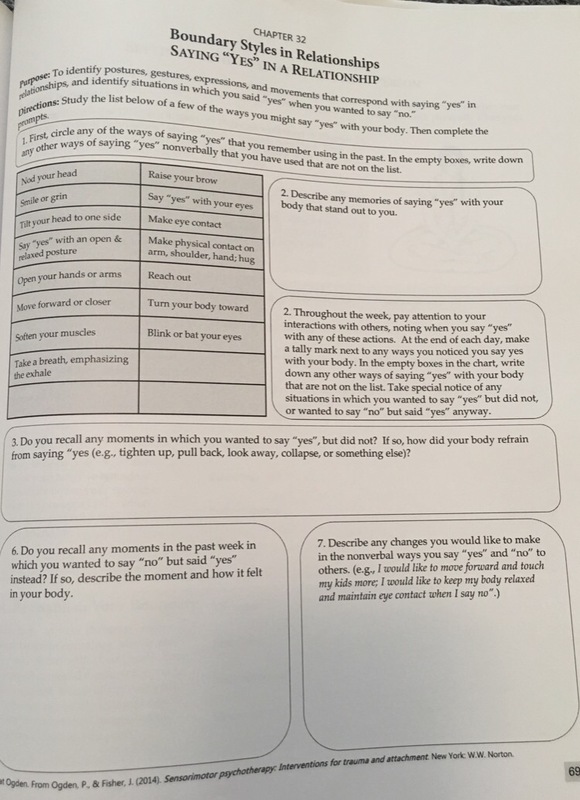 A while ago, I posted about taking photos of SP worksheets, and offered to share them here if people were interested. This is the first chapter I’m going to share. 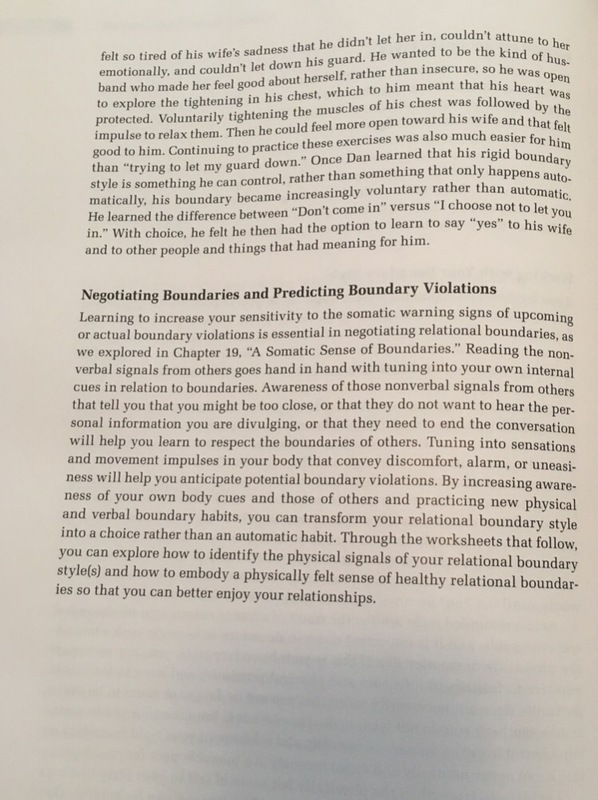 The chapter deals with boundaries. 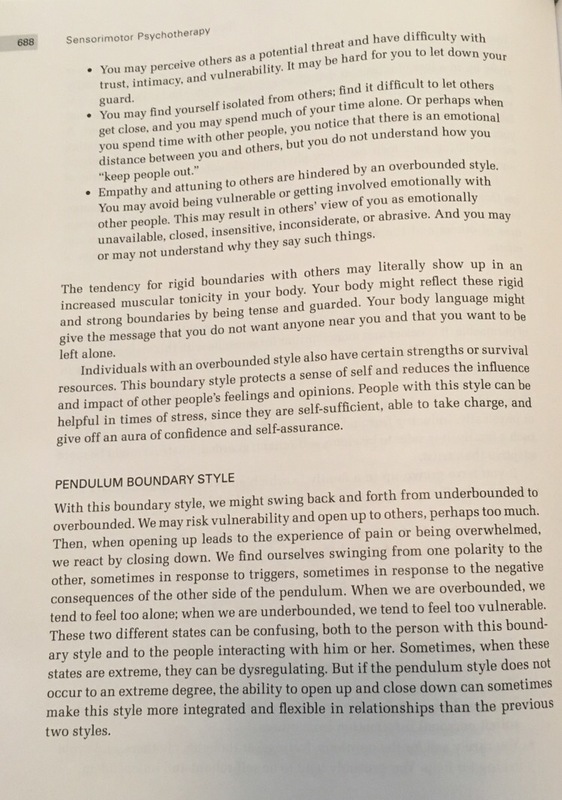 This is a theme (boundaries and control) that tends to come up again and again for me, and has definitely come up in the last few weeks. The rest of the week after Monday’s slightly odd session, I avoided thinking about much of anything. When I did stop for a minute and dig a little deeper, I thought about boundaries. I thought about how boundaries growing up in my family were very skewed. I never heard the word no. Seriously, my parents never said no to me. I think it was partly they sucked at setting boundaries, but also I knew what I could ask for and what wasn’t okay to ask for. I knew all the unspoken rules and nuances from a very young age. And I followed all the rules, because I didn’t want to be left. I don’t understand, how my parents could have such solid strict boundaries when it came to keeping out emotions and negative stuff and then have no boundaries in other ways. I realized that, for me, this idea Bea had when we had our most recent rupture, that we could disagree and still be on the same side was new to me. I hadn’t experienced that before. Where were the boundaries my parents were supposed to have to help me become myself? 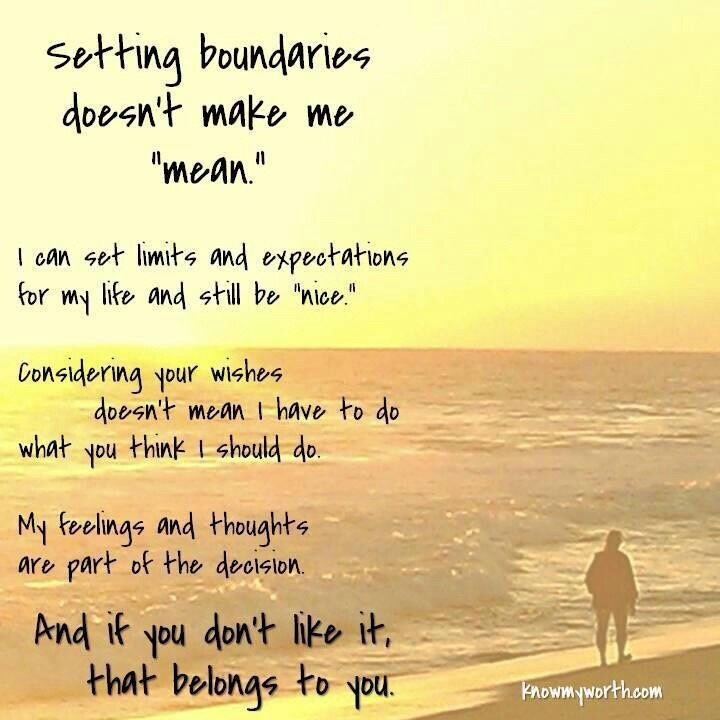 Where were boundaries that taught me it was okay to say no? Where were the boundaries that helped me learn where I ended and where others began? Therapy brought up discussion about which of the five F defenses do I default to. I didn’t know. It came up as Bea and I were discussing my behavior of running from Kay, and Bea wondered aloud which defense I used most. As we talked, she said she thought I used friendship/attachment cry the most. “You don’t like to think that attachment is your defense. It is scary to think that,” Bea said. I shook my head. “Yeah….but I don’t think that’s it.” The thing is, with Bea, it might be. But I have worked really hard to go against my instinct to run away from her. I want to heal. I want to grow and be healthier. I also know what *normal* looks like, and it’s not normal to run out of a therapy session or to run away from a new friend just because they have said or done something that was triggering. I say as much to Bea. “That makes sense. You can walk out here, if you need to. That is okay.” Bea says. She suggests that I might think about this defense stuff and boundaries and relationships this week. And so I do. I think and read a lot, and I decide that flight is my defense. The more I read about the five F’s the more I was sure flight is my primary defense. Flight is any means the individual uses to put space between themselves and the threat. It may involve sprinting away from the perceived danger, but is more likely exhibited as backing away or, particularly in children, as hiding. Avoidance is the go-to symptom of a flight response to uncomfortable feelings. Whether it be out of anxiety or acute stress, these are the people who are harder to connect with for many good reasons. They are the ones who try desperately to avoid any sort of intimacy or vulnerable moment with others by keeping many interactions at some surface level because that feels safest. Flight types appear as if their starter button is stuck in the “on” position. They are obsessively and compulsively driven by the unconscious belief that perfection will make them safe and loveable. As children, flight types respond to their family trauma somewhere along a hyperactive continuum that stretches between the extremes of the driven “A” student and the ADHD dropout running amok. They relentlessly flee the inner pain of their abandonment and lack of attachment with the symbolic flight of constant busyness. When the obsessive/compulsive flight type is not doing, she is worrying and planning about doing. Going by that, even my dissociation is a type of flight. At first glance, it seems as if it is possibly a freeze response, but dissociation is my way of avoiding uncomfortable, scary situations. For me, it is all about going far away. It is about leaving and avoiding. I share this with Bea, and she finds it very interesting. She also agrees with me. The other interesting thing I found was a description of how these defenses work in a *normal* person. 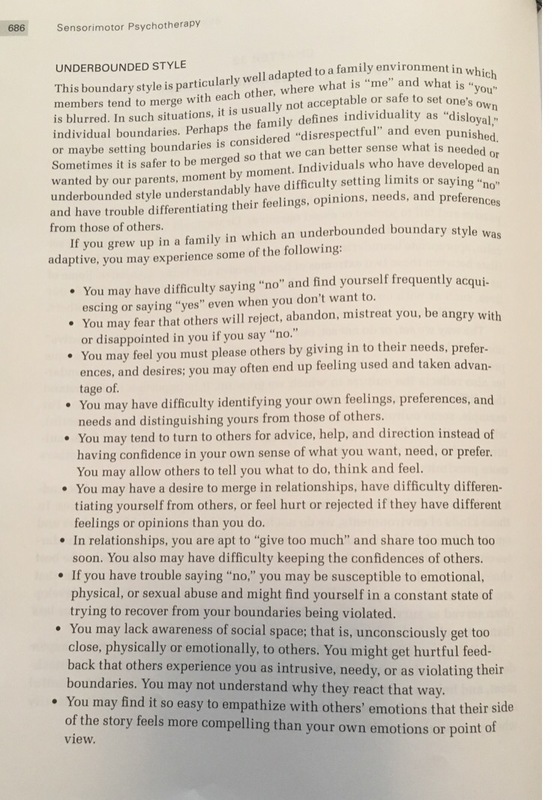 Walker (n.d.) outlines four basic defenses that most people use in life, but which in CPTSD become fixated and maladaptive due to ongoing trauma. These include the Fight, Flight, Freeze and Fawn and a number of hybrid types. When the Fight response is healthy an individual will have solid boundaries and the ability to be assertive when need be, whereas in CPTSD the person will become overly reactive and aggressive towards others. With a healthy Flight response, the individual is able to recognize when a situation or person is dangerous and withdraw or disengage whereas those with CPTSD will tend to isolate themselves socially to avoid threat. A healthy use of the Freeze response ensures that a person who is in a situation where further action will exacerbate things, stops and reassesses. 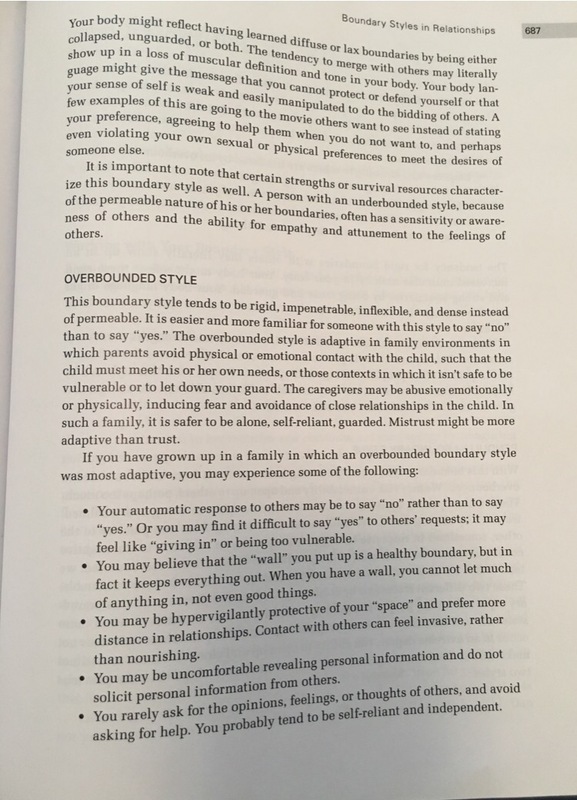 And finally a Fawn response ensures that the individual listens and compromises with others, while someone with CPTSD will adopt a people pleasing approach to avoid conflict. I stayed pretty much on the surface, and In this more analytical mode. I think it felt safer, in some ways, just in case Bea wasn’t actually back.